Spherical Plain Bearing GEF.ES 2RS Series uses a lubricant as an intermediate medium to separate the rotating shaft from the fixed frame (seat) for friction reduction. It is a bearing that works in sliding friction. Its basic structure includes the bearing shell (sleeve) and the journal. Spherical Plain Bearing GEF.ES 2RS Series is mainly used in applications where rolling bearings are difficult to meet the requirements of work, such as high speed, long life, low frictional resistance, high impact load, low noise and no pollution. 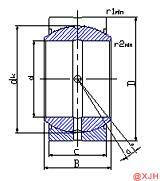 In addition, in order to reduce costs, Sliding bearings are also often used for some very simple swivel bearings. Spherical Plain Bearing GEF.ES 2RS Series has a smooth working surface and the bearing wear rate is usually approximately constant. When the accumulated wear amount is greater than the design allowable wear value, the bearing will fail and die into a wear. The main cause of wear is the overload or overspeed operation of the unit; the lubricant contains too much magazine, the lubrication is poor, and the bearing is not running. Wait a minute. Therefore, it is necessary to ensure the lubrication of the normal operation of the bearing. It is necessary to timely maintain and maintain the lubrication system and sealing system of the unit, replace the lubricating oil, ensure that the particle content and size of the lubricating oil are within the allowable range, and strictly operate according to the operating procedures.